Classic Canadian dessert! 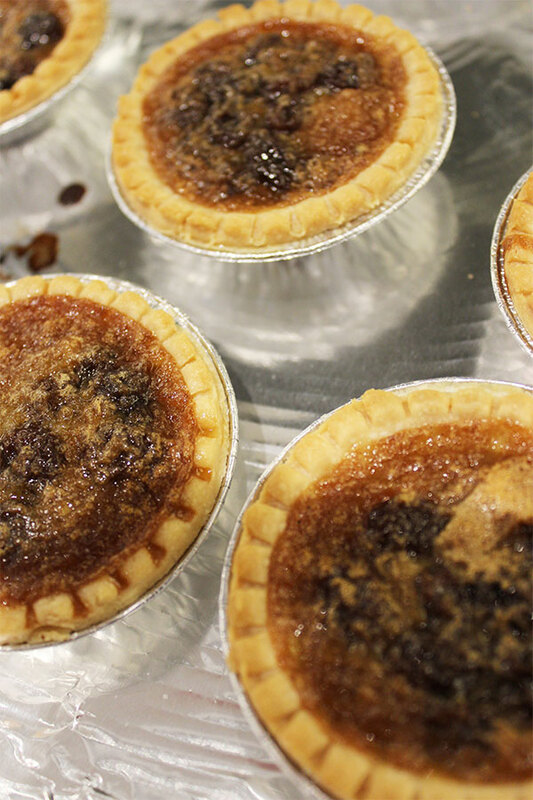 I love butter tarts and usually only make them at Christmas but obviously are good all year round. This filling is rich and a bit runny, and has a very subtle hint of cinnamon and is optional. This recipe calls for raisins but you can easily substitute these for walnuts or pecans if you prefer. Best to mix this filling with a fork or whisk as opposed to a mixer, so as not to make the filling too frothy. This may cause the filling to overflow when baking in the oven. I must admit in this picture I am using prepared pastry tarts, but aspire to make my own pastry one day! You can also obviously use your own pastry to make shells – and if so – good for you! This filling recipe makes about 24 tarts. Put the raisins in a measuring cup or bowl and pour the boiling water over top to steam the raisins. Let sit for about 15 minutes and then drain water and set aside. Cream the butter in a medium sized bowl and add in brown sugar. Mix thoroughly. Add in corn syrup, salt, vanilla, cinnamon, and vinegar and blend evenly using a fork or whisk. Beat eggs lightly and fold into brown sugar mixture to complete filling. Place tart shells evenly spaced on a cookie sheet. Sprinkle in about a teaspoon of raisins into each tart shell. Once completed, pour the filling into each shell until about 2/3 full. Place tarts in the oven at 400 degrees for 10 minutes then reduce the temperature to 350 degrees for an additional 10 minutes or until nicely golden brown.